To reduce the risk of a peanut allergy, parents should introduce their children to peanuts early and often, according to new guidelines from the National Institute of Allergy and Infectious Diseases (NIAID). The new recommendation is based on the results of a clinical trial called LEAP, in which researchers discovered that peanut avoidance wasn’t the most effective way to slash the risk of a peanut allergy. On the contrary, the study found that early exposure to “age-appropriate” forms of peanut products, such as peanut butter and peanut powder, can help cut the chances of peanut allergy in high-risk babies (defined as those with severe eczema and/or an egg allergy). Parents should discuss this with their child's physician before trying it. You should never make major personal healthcare decisions based solely on news reports of research studies. Parents should consider their child’s level of risk for a peanut allergy before proceeding with peanut introduction, experts say. The guidelines divide risk into three categories: high, moderate, and low. 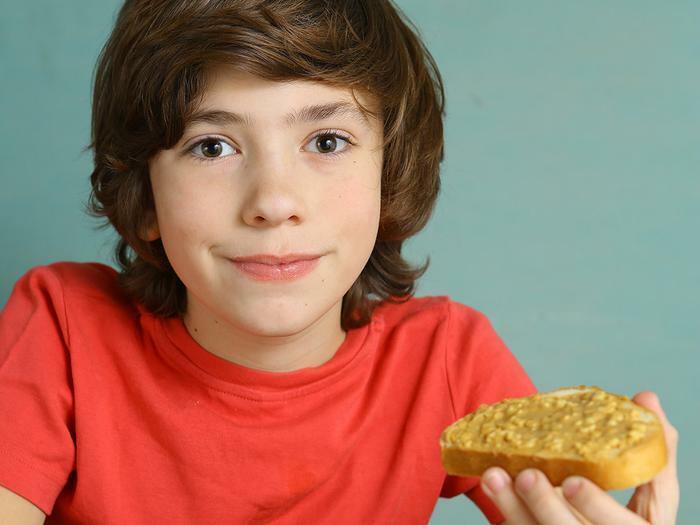 "If your child is determined to be high risk, the new guidelines recommend evaluation by an allergy specialist, which may involve peanut allergy testing, followed by trying peanut for the first time in the specialist's office," said Matthew Greenhawt, allergist and co-author of the guidelines, in a statement. High risk babies should have peanut-containing foods added to the menu as early as 4 to 6 months of age, according to the guidelines. Babies at “moderate” risk, due to mild to moderate eczema, should be introduced to peanut-containing foods at around six months of age. Children who aren’t deemed high risk (those with no eczema, food allergies, or family history of either) can be fed peanut-containing foods at any age, but ideally starting at around six months of age. In 2000, the American Academy of Pediatrics advised parents to hold off on introducing peanuts to children at high risk for allergies until they were 3 years old. But these recommendations did little to combat the rising rate of peanut allergy in children in the U.S., and were rescinded in 2008. The new guidelines are the result of more recent studies suggesting that early exposure to peanut-containing products can help protect kids from allergies. However, safety is an important factor when introducing peanuts to little ones. Babies should be introduced to peanut-containing foods when they are healthy, and only after they've begun eating solid foods, according to the guidelines. Infants should also never be given whole peanuts, which can be a choking hazard. One way to introduce peanuts in a safe manner is to mix smooth peanut butter with breast milk, formula, or warm water. This "natural way" of providing early exposure to peanuts may help the immune system develop a tolerance, says Dr. Alkis Togias, co-author of the guidelines. The guidelines are published in the  Journal of Allergy and Clinical Immunology.